Shirts With Random Triangles: Atlanta Journal-Constitution publishes satirical story about Texas A&M installing maroon field at Kyle Field as fact. 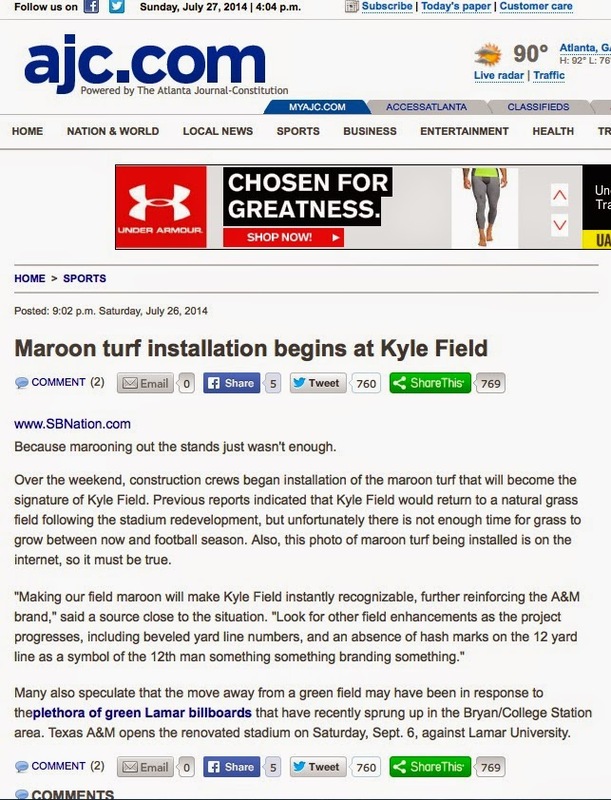 Atlanta Journal-Constitution publishes satirical story about Texas A&M installing maroon field at Kyle Field as fact. The Atlanta Journal-Constitution is a joke of a newspaper. It's mockingly been said that if the end of the world near, the AJC's headline of the day would read "Coke announces new product." A sample of the story. "Over the weekend, construction crews began installation of the maroon turf that will become the signature of Kyle Field. Previous reports indicated that Kyle Field would return to a natural grass field following the stadium redevelopment, but unfortunately there is not enough time for grass to grow between now and football season. Also, this photo of maroon turf being installed is on the internet, so it must be true." Which of course it wasn't. The paper's website reprinted in full a satirical article published by SB*Nation's excellent (and hilarious) Texas A&M sports blog, Good Bull Hunting. It was playing along with internet rumors about the school going all Boise State with Kyle Field. GBH made sure it was labeled as such, under the tag "Funny Stuff." As of Sunday, afternoon on July 27, the story was still up on ajc.com, without correction, indication of its satirical nature, or apology on the paper's part for being so stupid. *Yes, the AJC has writers like Jeff Schultz and Mark Bradley writing for them. If you ever read them, you'd DQ them as "real journalists as well."